The fourth place Dodgers (12-17) take on the first place D-backs (21-8) in the third game of a four-game series at Chase Field on Wednesday night. The series — and the season — has been a disaster so far for the Dodgers. They’ve lost four straight, and they’ve dropped seven of eight against the D-backs this year. The Snakes are formidable opponents this season. They’ve won 9 straight series to open the season. The Dodgers will need to figure out how to beat them at some point if they aim to capture their sixth consecutive NL West division title. Right now, things look pretty bleak. Even with Clayton Kershaw on the mound, the Dodgers can’t seem to find any traction. They currently sit nine games out of first in the NL West. 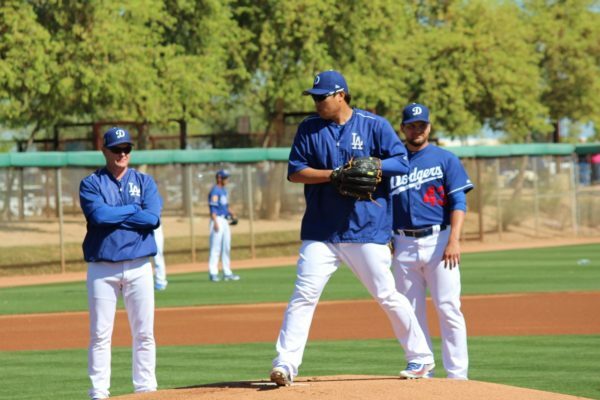 Hyun-Jin Ryu (3-0, 2.22 ERA, 3.23 FIP), the most consistent Dodgers starter, faces off against Zack Godley (4-1, 3.81 ERA, 3.30 FIP) as the Dodgers look to avoid yet another series loss. Last time out, Evan Longoria and Brandon Crawford homered against Ryu in the 6-4 loss in San Francisco, but Tony Cingrani‘s “dead arm” and Pedro Baez‘s balk ultimately sunk the Dodgers. Ryu looks to continue his admirable comeback, and the Dodgers look to get a win any way they can. He’s been one of the few glimmers of hope and one of the best starters for the Dodgers this season. The southpaw leads the team in WHIP (0.85) and opposing batting average (.152). He’s second to Kershaw in strikeouts (34) and just behind Alex Wood in K/9 (10.80). The D-backs beat Ryu back on April 2, scoring three runs off five hits with five walks in 3 2/3 innings. It was the left-hander’s shortest start of the season, but he bounced back thereafter and has pitched well. Left-handed hitters are hitting just .095 against Ryu with two hits in 21 at-bats. Overall against the Snakes, he’s 3-3 with a 3.98 ERA in 11 career starts, but at Chase Field he’s 2-2 with a 5.08 ERA in six starts. He’ll have to pitch carefully to Paul Goldschmidt, who’s hitting .455/.520/.864/1.384 with three doubles, two home runs and seven RBI against him. Godley won his first start against the Dodgers on April 3 for Arizona, but he lost in the second match-up on April 15 when the Dodgers tagged him for six runs (5 earned) on five hits and six walks in four innings. The right-hander has fared better at home (2-0, 2.19 ERA) than on the road (2-1, 5.06 ERA). Overall, he’s 2-2 with a 3.79 ERA in 10 career games (six starts) against L.A.
We’ve lived through Dodger losing streaks before, many of them much longer than the current four-loss skid. This time around it seems to sting a lot more than usual. Losing Justin Turner right before the season started was a huge blow to the team, but the loss of Corey Seager for the remainder of the season could be one of the more devastating injuries the Dodgers have had to overcome since Kershaw’s back injury. Aside from the injuries, the other guys who are seemingly healthy aren’t performing at expected levels. The ominous sewage spill during the Freeway Series may have warned what was to come, because the Dodgers have indeed been playing like crap. The bullpen has been a cesspool, and their collective 4.77 ERA, 4.36 FIP, 1.45 HR/9 places them among the worst pens in the league. They have the most blown saves in baseball with eight. They’ll attempt to not be totally embarrassed by the D-backs — a division rival they’ve only bested once this year — on Wednesday. I’m not sure there’s a clear cut answer to their woes. They’ve been playing poorly across the board, but the bullpen and inconsistent offense are the glaring concerns right now. Get healthy and play better, guys.